As part of 2016’s Luminate, Scotland’s creative ageing festival, and with support from Scottish Care, Documentary Filmmaker and Photographer Duncan Cowles worked at North Merchiston Care Home in Edinburgh to create a collection of short films directed by residents. From this coming Monday 20th March a film a week will be released to the public. We spoke to Duncan to find out more about this fascinating project. Can you tell us a bit about Directed by North Merchiston? Directed by North Merchiston is a project that was inspired by one of my previous films Directed by Tweedie where I attempted to get my Granddad to make a film, and I helped him to do it. With this new project I wanted to try and take that idea into a care home and work with the residents on making some short films. One of the biggest issues for older generations today is loneliness. I wanted to give the residents of North Merchiston Care Home a voice, and ultimately provide them with both an audience and platform so that they could say whatever they wanted and create memories for their families. So instead of me coming in with my camera and making films about the people living there, I wanted the residents to think of themselves as the filmmakers and what story they’d personally like to tell. The result is a series of five short films. I think each one of the residents has really enjoyed the process. Some were slightly reluctant initially, but once we got started admitted that they were having a laugh, and were glad they’d agreed to take part. Some of them have spoken about how they’ve appreciated me simply coming in and spending time with them, and taking an interest in their lives. I think this will ultimately be one of the most valuable outcome of the project; the enjoyment that they’ve all had taking part. Hopefully that comes across in the films. The five residents that Duncan worked with to produce the short films. Any favourite moments from the project? Watching the footage back with the participants, and asking them about what bits they liked the most, and the things they would like to be focused on in their films, was really touching for me. For example; Edith who’s 90 years old, talked about how her Grandmother used to say to her when she was a wee girl, that the best thing in life was that: “It was nice to be needed”, particularly as an older person. Then deciding with Edith that the film could focus on that and be a little tribute to her Grandmother, I could see meant a lot. Definitely on a personal level, having the honour to get to know these people as they’re in their later years, has been amazing. As a 26 year old I, like many others, still have a lot to learn about life and all of its ups and downs. These people have experienced it, they’ve been through so much, and listening to them talk about it, how they’ve coped and what they think and feel looking back over it all, is just staggering. It’s an education going into a care home, and it really makes you reflect a lot upon your own life, circumstances and future. Why are creative outreach projects like Directed by North Merchiston important? Everyone is creative, whatever our ages, and the chance for care home residents to take part in a project like this can offer all sorts of benefits. I’ve been going in and out of the care home for the past two months and seeing a positive change happen immediately in front of my eyes. Something like this isn’t necessarily a very public facing activity, but is equally as important as it’s making a difference to people directly. Initially we did a really small screening of the films for friends and family in the care home. The hope is that the films will take on a life of their own, as we share them to a wider audience. It’s really important that older people’s voices are heard by other generations, and often that doesn’t happen. You can catch the first film May: This is Your Life here. At the speed of love..
Today we bring you some more glorious poetry from Anne Connolly for the Easter weekend,we will let Anne herself explain where these came from. Anne Connolly was one of the stars of Luminate last year. Find out more about Anne and watch her read some more of her poetry in this previous post..
On 1st October Citadel Arts Group received the Age Scotland Member Group of the Year Award at a ceremony in the Scottish Parliament. See the video, in which Liz Hare, Artistic Director, and playwright Alan Mountford, talk about the benefits of creativity and what the Award means to them. Citadel Arts Group develops and expresses creativity and memories in older people in Edinburgh and Midlothian. Its activities include; ‘living memory’ projects with dementia sufferers, memory inspired plays performed by frail older people alongside primary school children, and helping recently retired people develop play-writing skills. The group’s achievements include a performance at the Leith Festival 2012 of a play by an older writer inspired by memories of old Leith hospital. It has been a member of Age Scotland for two years, which has grant-supported production of 6 drama productions in that period. The Age Scotland Member Group of the Year Award is sponsored by David Urquhart Travel. It is given to the member group whose activities have championed the needs of older people and had a profound impact on its members. Luminate 2013: What will you do? The 2013 programme for Luminate; Scotland’s creative ageing festival, was announced today. Luminate Director Anne Gallacher offers a preview. Highlights of the 2013 festival include two commissions by Luminate. Live Music Now is a UK wide charity that provides performing and training opportunities to outstanding young professional musicians who take their performances to a wide range of community settings. Bill Sweeney has been commissioned to create The Luminate Suite, based on music, poems and stories remembered and shared by older people from the Western Isles. During the festival, Live Music Now musicians will premiere the new song cycle for the older people who helped create it. The charity’s performers will also tour care homes and centres throughout Scotland as part of Luminate’s Outreach programme. Recount, the second Luminate commission, will incorporate three site-specific installations on Shetland. During the Cold War, the islands played an important role in NATO’s Early Warning System, hosting the most northerly Royal Observer Corps bunkers designed to operate as monitoring stations in the event of nuclear attack. Artists Roxane Permar and Susan Timmins will explore islanders’ recollections of Shetland’s role in the conflict to create site-specific artworks incorporating text, sound and luminescent textiles. Other Luminate highlights around the country include Super Vivere, an exhibition by photographer Susie Rea that uses stunning portraits, audiovisual narrative and text to explore the lives of siblings who are over the age of 90. The project is a collaboration with Dr Maeve Rea of Queen’s University, Belfast and both Susie and Maeve will give a Gallery Talk at macrobert, Stirling on 1 October marking the opening of both the exhibition and Luminate. The work can be seen at macrobert from 1 – 10 October before transferring to Platform, Easterhouse from 22 October. One of the major performances of the festival is Theatre Ad Infinitum’s award-winning Translunar Paradise, which is also part of Dance Live at The Lemon Tree, Aberdeen and tours to Eden Court, Inverness, The Beacon, Greenock and Traverse Theatre, Edinburgh. This exquisite piece of mask and movement theatre, featuring live accordion accompaniment, tells the story of William, who escapes to a paradise of memories after his wife’s death but ultimately must learn to let her go. A must-see at Edinburgh’s Royal Lyceum Theatre on 2 October is the Curtain Raiser on Dark Road with Ian Rankin when the author will discuss the inspiration for his first play with Jackie McGlone. Also in Edinburgh on 25 October, 24 Carat Gold, a choreographic group made up of members of Dance Base’s over 60s group, Golden, will take on a group of young dancers for a high energy performance at Dance Base. One of Scotland’s treasures Jackie Kay will be at the Lochgelly Centre, Fife on 23 October, reading extracts, stories and poems from her latest book Reality Reality. Other performances of her work will also take place during Luminate. macrobert, Stirling will host a reading of the play Mind Away as part of their Exploring Arts and Dementia day on 25 October and her hilarious and heartbreaking new musical comedy, The Maw Broon Monologues, starring Terry Neason and Suzanne Bonnar opens on 29 October at the Tron Theatre, Glasgow as part of the Glasgay! festival. The 2013 Luminate film tour highlights the increasing influence of older cinemagoers and older artists in this often youth-orientated business. Both the films selected – The Best Exotic Marigold Hotel and This is Martin Bonner – have something to say to all of us about dealing with age and the ageing process. 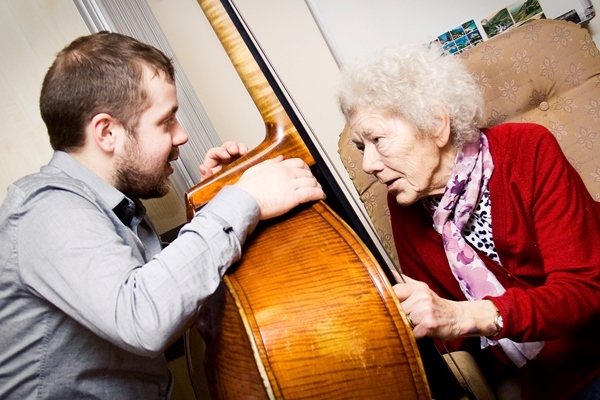 In addition to the public programme, Luminate includes Outreach activities and performances that take the festival into care homes, sheltered housing communities and local groups across the country throughout October. This year’s Outreach programme includes a screening from the Luminate Film Tour at Viewpoint Housing in Edinburgh, selected by residents to share with their family and friends, and performances of Puppet State Theatre’s acclaimed production The Man Who Planted Trees in care settings across Tayside. The Luminate 2013 programme is available online at www.luminatescotland.org and hard copies can be requested by emailing the Luminate team or calling 0131 668 8066.